Brno by population and area is the second largest city in the Czech Republic, the largest Moravian city, and the historical capital city of the Margraviate of Moravia. Brno is the administrative center of the South Moravian Region where it forms a separate district Brno-City District. The city lies at the confluence of the Svitava and Svratka rivers and has about 400,000 residents, its greater metropolitan area is regularly home to more than 800,000 people while its larger urban zone had population of about 730,000 in 2004. Brno is the capital of judicial authority of the Czech Republic – it is the seat of the Constitutional Court, the Supreme Court, the Supreme Administrative Court, and the Supreme Public Prosecutor's Office. Beside that, the city is a significant administrative centre. It is the seat of a number of state authorities like Ombudsman, Office for the Protection of Competition and the Czech Agriculture and Food Inspection Authority. Brno is also an important centre of higher education, with 33 faculties belonging to 13 institutes of higher learning and about 89,000 students. There is also a studio of Czech Television and the Czech Radio, in both cases by law. Brno Exhibition Centre ranks among the largest exhibition centres in Europe (23rd in the world). The complex opened in 1928 and established the tradition of large exhibitions and trade fairs held in Brno. Brno is also known for hosting motorbike and other races on the Masaryk Circuit, a tradition established in 1930 in which the Road Racing World Championship Grand Prix is one of the most prestigious races. Another notable cultural tradition is an international fireworks competition, Ignis Brunensis, that usually attracts one or two hundred thousand daily visitors. The most visited sights of the city include the castle and fortress Špilberk and the Cathedral of Saints Peter and Paul on Petrov hill, two formerly medieval buildings that form the characteristic cityscape and are often depicted as its traditional symbols. The other large preserved castle near the city is Veveří Castle by the Brno Dam Lake. 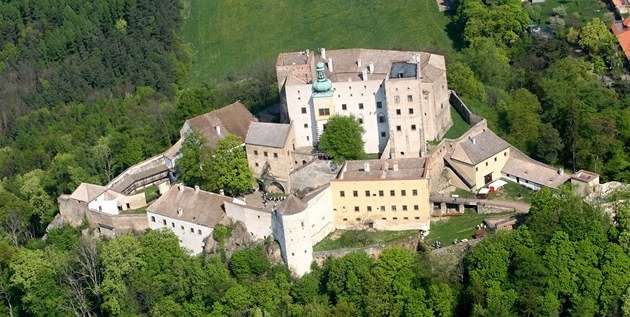 This castle is the site of a number of legends, as are many other places of Brno. Another important monument of Brno is the functionalist Villa Tugendhat which has been included in the UNESCO list of World Heritage Sites. One of the natural sights nearby is the Moravian Karst. Brno was recognised as a town in 1243 by Wenceslaus I, King of Bohemia, but the area had been settled since the 2nd century. It is mentioned in Ptolemy's atlas of Magna Germania as Eburodunum. From the 11th century, a castle of the governing Přemyslid dynasty stood here, and was the seat of the non-ruling prince. During the 14th century, Brno became one of the centres for the Moravian regional assemblies, whose meetings alternated between Brno and Olomouc. These assemblies made political, legal, and financial decisions. They were also responsible for maintaining regional records. During the Hussite Wars, the city remained faithful to Sigismund, Holy Roman Emperor. The Hussites twice laid siege to the city, once in 1428 and again in 1430, both times in vain. During the Thirty Years' War, in 1643 and 1645, Brno was the only city to succeed in defending itself against Swedish sieges, thereby allowing the Austrian Empire to reform its armies and to repel the Swedes. In recognition of its services, the city was rewarded with a renewal of its city privileges. In the years following the Thirty Years' War, the city became an impregnable Baroque fortress. In 1742, the Prussians vainly attempted to conquer the city, and the position of Brno was confirmed with the establishment of a bishopric in 1777. In 1805, The Battle of Austerlitz took place about 10 kilometers (6 miles) southeast of Brno. In the 18th century, development of industry and trade began, and continued into the next century. Soon after the industrial revolution, the town became one of the industrial centres of Moravia and the Austro-Hungarian Empire – sometimes referred to as the "Moravian Manchester". In 1839, the first train arrived in Brno. Together with the development of industry came the growth of the suburbs, and the city lost its fortifications, as did the Spielberg fortress, which became a notorious prison to which were sent not only criminals, but also political opponents of the Austrian Empire. Gas lighting was introduced to the city in 1847 and trams in 1869. Mahen Theatre in Brno was the first theatre building in Europe to use Edison's electric lamps, Thomas Edison then visited Brno in 1911 to see the theatre. During the "First Republic" (1918–1938), Brno continued to grow in importance – Masaryk University was established (1919), the state armoury and automotive factory Československá státní zbrojovka Brno was established (1919), and the Brno Fairgrounds were opened in 1928 with an exhibition of contemporary culture. The city was not only a centre of industry and commerce, but also of education and culture (see the section on notable people from Brno). In 1939, Brno was annexed by Nazi Germany along with the rest of Moravia and Bohemia. All Czech higher education institutions were closed down on 17 November including four universities in Brno. 173 students were sent to Sachsenhausen concentration camp and Kounic's students residence was transformed into Gestapo headquarters and prison. Brno was liberated on 26 April 1945 by Red Army after more than two weeks of heavy fighting. After the war, and the reestablishment of the Czechoslovak state, the majority of the ethnic German population (except antifascists, members of the resistance, mixed marriages, etc.) was expelled to Germany or Austria. The expulsion of some 20,000 Germans is referred to as Brno death march. Established by Prince Vladislav I in 1115, the Benedictine monastery at Kladruby was set into a sparsely settled landscape inhabited by Slavonic population. It was provided with vast estates; in particular, in a triangle formed by the Mže River, the Úhlavka River and the frontier forest. 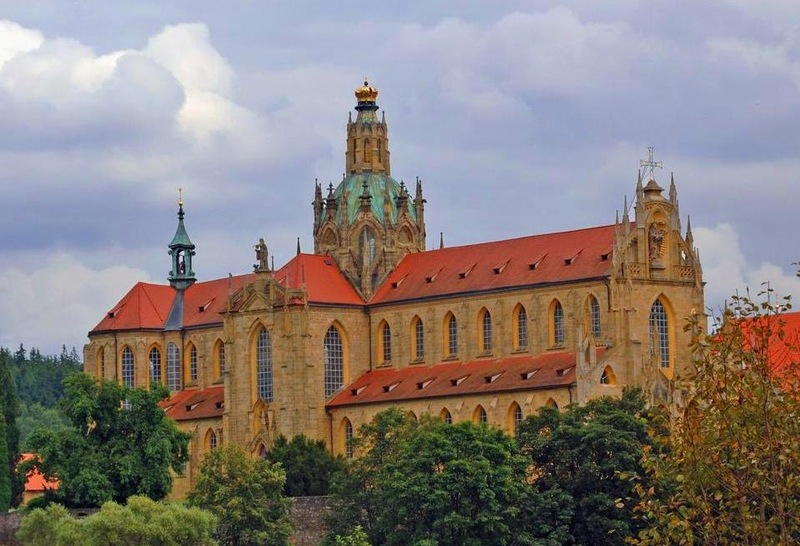 The first Czech monks were soon joined by missionaries from the nearby town of Zwiefalten. Close relation with Zwiefalten were being kept even later, when the Czechs recovered their numerical superiority in the monastery. Several times, the monastery became a venue of discreet diplomatic negotiations. For example, against the background of the culminating conflict between the Czech church and the temporal lords, Přemysl I met here representatives of the curia. After having been Gothicized, the original Romanesque church was consecrated in King Wenceslas I’s presence in 1233. Sometime around 1233, under Abbot Reiner, the village of (Old) Kladruby was established in the vicinity of the monastery; namely, next to the current churchyard. By virtue of the astute Abbot Reiner’s purposive acquisition activities, the monastery considerably expanded its estates around Kladruby. During the second half of the 14th century, the power and significance of the monastery constantly grew thanks to new privileges and progressive economic method. Another important feature was the development of the nearby locality of Kladruby, which was elevated to the township at that time. The monastery then possessed 128 villages administered by three provosts based at Kladruby, Touškov and Přeštice. Kladruby Monastery several times feasted Emperor Charles IV. Soon afterwards, however, Kladruby became a point of intersection where interests of the country’s top dignitaries incessantly clashed, thereby endangering the position of the monastery per se. Wenceslas IV decided to undermine the position of one of his most adamant adversaries, The Prague Archbishop John of Jenštejn, by establishing a new bishopric conceived to take over the estates owned by the monastery at Kladruby. Upon the death of Kladruby monastery’s Abbot Racek in 1393, however, the opponents managed to thwart the King’s intentions by promptly electing a new abbot, with the election immediately approved by the Archbishop’s Vicar, John of Pomuk. The resulting fierce conflict brought the archbishop into exile. After having been tortured, the half-dead John of Pomuk was thrown by the King’s adherents from the Prague Charles’ Bridge down to the Vltava River. Originally, the Hussite revolutionary movement only meant material damage to Kladruby, since the monastery had to provide financial aid to Emperor Sigismund. In 1421, however, the partially fortified monastery was conquered by John Žižka of Trocnov, with the monks having fled in time to Regensburg with their most precious possessions. Afterwards, the Benedictines intermittently returned and fled, but they eventually failed to prevent the neighbouring Utraquist and Catholic aristocrats from annexing the monastic lands. In 1467, the monastery was devastated due to the fights of the baronial league and the Crusaders against King George of Poděbrady. Until the late 15th century, consequently, the monastery frequently had to pawn and sell its property. The economic situation improved only slowly, with new mining and fish-pond-cultivating activities modestly contributing to the rehabilitation of the monastic domain. Simultaneously, the nearby townships of Touškov and Kladruby started to flourish again. Featured by the demanding reconstruction of Our Lady’s church (re-consecrated in 1504) and increasing diplomatic activities, the resurgence of the monastery did not last for long. With the position of the monastery perpetually unstable, even the fairly competent abbots failed to successfully face a host of unfavourable events at that time. Several misfortunes, including the extensive fire, which devastated the monastic buildings in 1590, along with prematurely abdicating abbots and incessant internal quarrels, only testify that the development of the monastery during the 16th century was not favourable. The Thirty Year’s War resulted in conquering and plundering the monastery and the nearby township by both the warring parties. Nevertheless, the monastery managed to take advantage of the Catholic Church’s post-war boom to retrieve the worst losses in a short time (as late as the mid-17th century, Kladruby Monastery possessed two townships and 28 villages). For that reason, the monastery could afford to carry out a challenging repair of Our Lady’s church as early as 1653. At that time, the grave of the monastery’s founder, Prince Vladislav I was uncovered, with the princely remains transferred to the altar situated in the nave. Within the framework of the 1728 remodelling, the remains were transferred to the high altar. The comprehensive reconstruction of the convent was completed in 1670, with the prelate’s old residence erected between 1664 and 1670. Notably, the monastery became a place of pilgrimage in 1658. the late 17th century and the first half of the 18th century witnessed the genuine heyday of Kladruby, with the monastery irreversibly securing its position in the surrounding landscape and going down in the history of Czech architecture. At that time, the monastery entered its final stage, marked by the activities of the so-called great abbots and builders; namely, Maurus Fintzgut, Josef Sieber and Amandus Streer. By regaining its farmstead at Přeštice in 1705 and buying some minor estates, the monastery virtually completed the rehabilitation of its property, thereby creating a material base for its subsequent activities. Consequently, in 1712 the monastery commenced the far-reaching remodelling of its dome. Supervised by the distinguished Baroque master-builder, Johann Blasius Santini – Aichel, the remodelling was completed in 1726, bringing about the culmination of the Czech Baroque Gothic style, primarily represented by Santini. One of the largest ecclesiastical structures throughout Bohemia, Our Lady’s church at Kladruby was completed and consecrated in 1726. After that, the works continued by erecting the new convent and the prelate’s new residence. The design was allegedly made by Kilian Ignaz Dientzenhofer. By 1739, north and south wings had been completed, with the monks being ushered into the new convent. The construction works, as a whole, were completed before 1770. The above mentioned abbots managed to stabilise the monastic estates, accelerate their economic development, strengthen the order and discipline within the monastery, and considerably enhance the monastic library. Moreover, they bolstered the monastery’s prestige by buying sacred remains and various works of art, as well as by gaining new privileges. Orientated towards the enlightened system of government, the state authorities, however, tended to increasingly interfere with the monastic jurisdiction, with the threat of dissolving the Benedictine order and closing the monastery still looming. Like many other monasteries, the Benedictine convent at Kladruby was eventually dissolved by Emperor Joseph II in 1785, two years after the death of Amand Streer who had no successor. The monastery’s movables were sold up by auction and the monks dispersed. Consisting of 38 villages, 15 farmsteads and 9 mills, the domain was then administered by a religious fund. In 1798, the monastic structures were utilised as a military hospital, temporarily housing Trappist monks from France before they left for Russia. Between 1800 and 1818, the monastery served as barracks, hospital and disabled soldiers’ home. In 1825, Kladruby Monastery (along with the surrounding lands and 23 villages) was bought by Field Marshal Prince Alfred Windischgrätz at 275 500 guldens. Nevertheless, he only paid one half of that amount, with the rest remitted thanks to his loyal support of the Austrian monarchy. Windischgrätz principally proved his loyalty by uncompromisingly intervening against insurgents in Prague, Vienna and Hungary in 1848. Having their ancestral residence nearby at Tachov, the lords of Windischgrätz paid little attention to Kladruby. In 1864 they established a brewery inside the original convent, with Our Lady’s church left to its fate. The situation did not change until 1918, when the Windischgrätz family lost its Tachov domain due to the land reform. Moreover, the main family line died out and the estates had to be divided. The new owner, Aladar Windischgrätz moved to Kladruby along with his great library and family archives. The Windischgrätz family possessed the Kladruby domain until the 1945 confiscation executed in compliance with the presidential decree. Administered by the Czech Ministry of Agriculture and the National Land Office, the lands were cultivated by Czechoslovak State Farms and Czechoslovak State Forests. Negotiations on allocating the monastic property to the Benedictine Order were held in 1946, with a pertaining allocation decree already issued, but the Benedictines did not take over the property. Accordingly, the property was conveyed to the Prague-based National Cultural Commission. After 1960 the condition of the monastery deteriorated due to housing headquarters of a state farm. After having been taken over by the Pilsen-based Regional Conservation Office in 1967, the monastery at Kladruby was opened to the public. Comprehensive reconstruction works have been conducted here since early 1970s, with the most substantial progress achieved after 1989 thanks to crucial financial contributions by the state authorities or other sources, including the Phare Programme of the European Union. Milotice castle is one amazing medieval manor house, which in the 16th century was converted into a magnificent baroque palace. Milotice is another beautiful monument in the Republic of Czech. It is located in the Czech region of Hodonin. Milotice has the status, Chateau. Until today the original architecture of the castle has not been preserved, hence having acquired the 18th century style. The original Milotice was built on the local uneven land in the 14th century. Total reconstruction in the 16th century made it a model in the spirit of the Renaissance tradition. Milotice castle was restored during the 17th century, but the last significant change in the 18th century made it what visitors see today. Today Milotice is open for public visits and you can learn a lot about the last family that lived in the castle - Seilern-Aspang. Ladislav Seilern was the last owner of the mansion, but since 1941 it held German citizenship, the castle Milotice was withdrawn in favor of the state and his family was forced to leave the palace. The earliest baroque ornaments of Milotice appeared in 1680, but the original plan of Renaissance palace with four floors, two wings and towers of the four corners of the structure was preserved. Between 1720 and 1750 the most significant improvements to the castle took place. The then owner, Karl Anton Sérenyi wished the castle to become more opulent and ornamented to appear beautiful facade pediments, additional sculptural ornaments and mythological deities on the architecture of the entrance. He also built stables, spas, and also organized a riding school in the castle of Milotice. Ceremonial entrance to Milotice can be reached by a beautiful stone bridge decorated with stone sculptures that were made by Jacob K. Schletterer in 1740. In interior terms Milotice has not much to boast off. The beautiful decorations and mortars at the premises were made between the 1723-1725 years by the Italian, Giovanni M.Fontana. As in the Vranov Castle, Milotice central hall is the hall of ancestors, where you can see a huge mural depicting the House of Sérenyi. Milotice castle is surrounded by a beautiful baroque garden. Today it regularly holds various cultural events including concerts and folklore. Quite often the castle Milotice is the host of weddings. 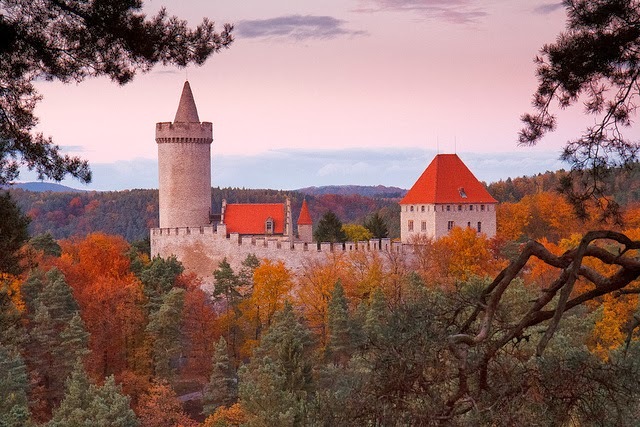 Orlík Castle is a chateâu located 500 m northeast of the village of Orlík nad Vltavou, in the northern part of the District of Písek, in the South Bohemia Region of the Czech Republic. The original position of the chateâu, on a rock 60 m above the Vltava valley, was altered by the creation of the Orlík reservoir in 1954-62, and the chateâu is now barely a few metres above the water level. The meaning of the name Orlík stems from the word "young eagle" (Czech: Orel). It is often suggested that this castle would have resembled an eagle or nest perched upon the rocky outcrop above a turn in the River. 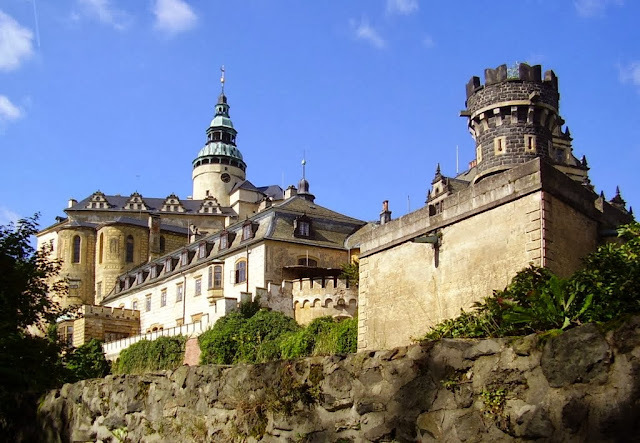 Orlík was established as a royal castle beside a ford across the River Vltava in the second half of the 13th century, probably by Přemysl Otakar II, although in the Middle Ages it came into the hands of noble families and its ownership changed many times. From 1408 the Zmrzlík of Svojšín family owned it, and during their time the Hussite Captain Jan Žižka of Trocnov stayed in the castle. In 1508 the castle burned down, and was rebuilt as a Renaissance chateâu by the new owners, the Lords of Švamberk. In 1623 the Eggenbergs acquired Orlík, and in 1717 it was inherited by the Schwarzenbergs. At the beginning of the 19th century it became their main residence. The most famous member of the family was Field Marshal Karl Philipp, Prince of Schwarzenberg, who was victorious over Napoleon in the Battle of Leipzig in 1813. In 1802 the chateâu was burned out, and during the subsequent repairs a fourth storey was added to the building. The current Romantic Gothic appearance dates from 1849 to 1860, when partial remodelling in this style was carried out according to plans by Bernard Gruber. The Early Gothic style castle of Orlík was confiscated by the Communist Regime after 1948, but in 1990s was reverted to the Schwarzenbergs. Access to the chateâu is by a stone bridge across the oat. Three round towers rise above the main façade, one of them being the original, built in the 14th century. The passage into the chateâu is cut into the rock and leads to a trapezoidal courtyard, with arcades on the ground floor. The oldest building is the former palace, which dates from the 14th century and forms the north side of the courtyard.The interiors are mainly in the Empire style, from the first half of the 19th century. The Lovecký sál (Hunter's Hall), with quadripartite ribbed vaulting, is original Gothic, and the chapel, also dating from the Gothic period, has a net vault. From an artistic point of view, the most valuable rooms are the state rooms on the first floor; the Greater and Lesser Knight's Halls; Hunting Hall; Blue and Empire Saloons; Library, and the Gun Corridor. The interiors are furnished in the style of the period and feature the family's collection of art works. Adjoining the chateâu is an English style large park, covering 143 hectares, with native and non-native species of trees and shrubs, and a greenhouse with a collection of fuchsias. The Pseudo-Gothic Schwartzemberk vault is situated in the western part of the park. The history of the castle in Nové Město nad Metují is nearly identical with that of the town itself. The castle is an integral part of the town's historical preservation area. Both the castle and the town were established in 1501. In the middle of the 16th century the castle was rebuilt in the Renaissance style, and again in the mid-17th century it was rebuilt in the Baroque style. 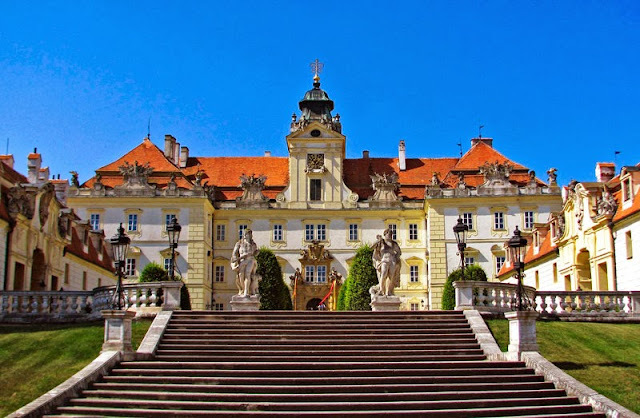 The castle and garden were redone for the last time by the architect Dusan Jurkovic in the years 1909-1915 at the request of the industrialist family Bartoň-Dobenín. During the tour you can see original interiors from that time in the Art Noveau and Art deco styles. Pavel Janák, as well as many other influential Czech artists, contributed to the decorations. In the area surrounding the castle, small Baroque statues by Matthias Bernard Braun attract the attention of visitors. 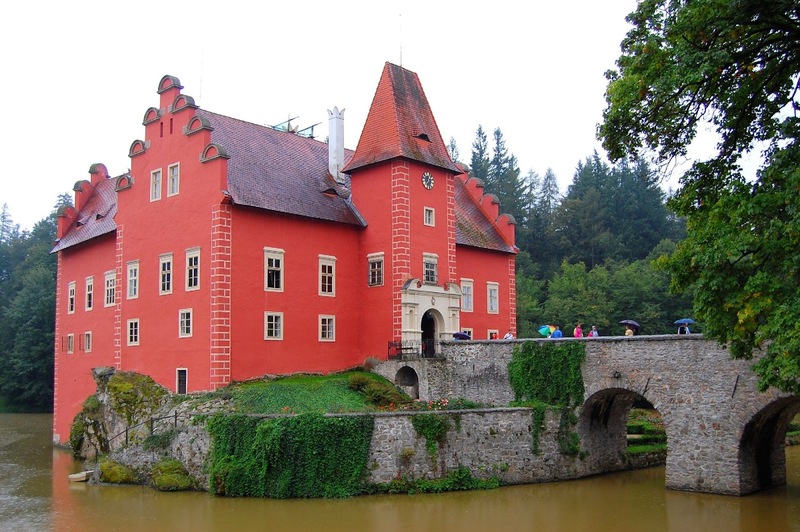 Kost castle is located in the Czech Republic, 80 Km north of Prague. This fortress was originally built after 1371, probably by Beneš of Wartenberg, who had the long hall and tower erected as a defensive castle. 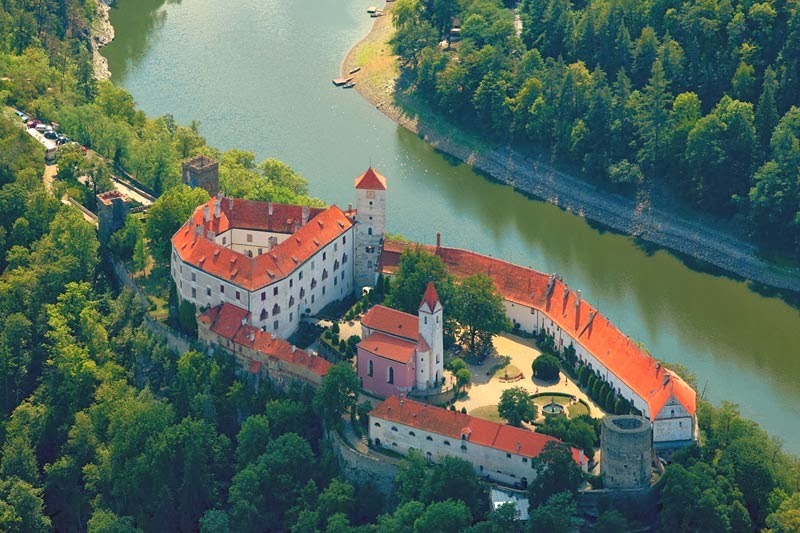 It was then acquired, in 1456 by John Hasenberg, but he took part in a rebellion against his king ,George of Podebrad and his son sold Kost castle and the castle Trosky to John of Schellenberg, in 1490. After 50 years, Jan of Biberstein had the “Renaissance” wing of the castle built, with the big kitchen. 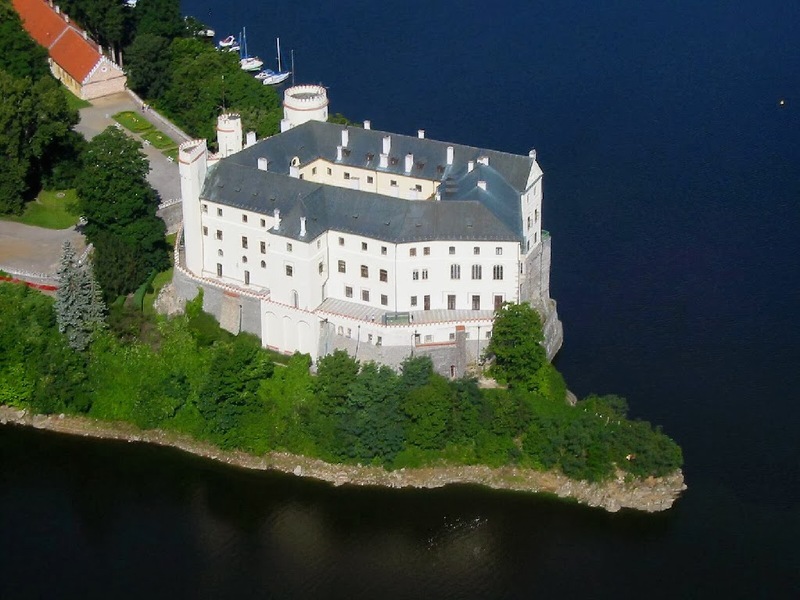 His niece inherited Kost castle, and her husband, Krisof Popel of Lobkowitz, added the brewery, the “Lobkowitz” palace and other farm buildings, which were fortified and joined to the castle. Albrecht of Waldstein’s plans to redesign Kost into a country home while remaining a stronghold were halted by his death in 1634. In 1635, a part of Kost Castle was destroyed by fire after which it ceased to be inhabited by the proprietors. Bought by the Czernins of Chudenicz, the castle apartments were used as granaries at end of the 17th century. The Castle suffered during the 30-years-war and was supposed to be destroyed. After 1867 Kost castle was in part reconverted in neo-gothic style. In 1798 Casimir Netolitzky bought Kost and the surrounding lands and entailed the property,ensuring inheritance by male primogeniture. Kost castle later passed by marriage to the dal Borgo Netolický family (1889) and then to the Kinský dal Borgo family (1993). Kost Castle is dominated by the angular White Tower, which is five storeys high, the south-eastern part pointing towards the Plakánek valley. The tower is a part of the battlements erected from stone blocks. It was destined to the defence. The mansarde roof dates only from the 18th century. The Castle has a smaller cylindrical tower from the end of the 14th century close to the main gate. Today Kost Castle is one of the major tourist attractions in the Czech Republic, also thanks to its charm, facinating exposition of authentic weapons and lifestyle in the middle ages. It is located in one of the most attractive regions of the Czech Republic: the "Český Ráj" meaning Czech Paradise due to the beauty of its nature and landscape. Visitors of Kost castle can enjoy the magical atmosphere of the surrounding forests and lakes while taking a bike tour or even tour the countryside by horse. The castle offers cultural visits but also many attractions such as a medieval tournament which happens under the castle walls. 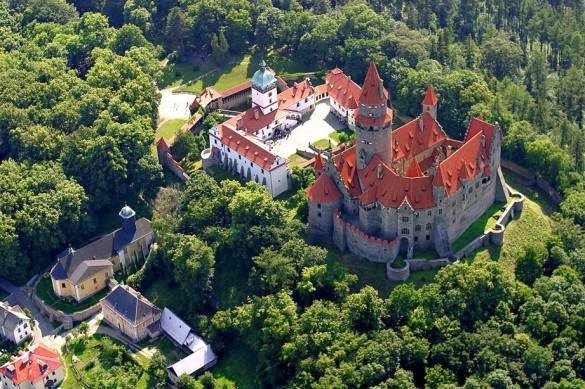 You can also get married at Kost castle or have your company event in one of the most beautiful and authentic Gothic castles in the Czech Republic. Kost castle in fact can be hired for a variety of events including weddings, company events, filmings and concerts. If your dream is to taste the life of the middle ages you can also rent the accomodation within the castle premises, which is comfortable, romantic, and offers a unique view. The Konopiste Castle was originally founded as a gothic fortress guarding a nearby town of Benesov. Being founded at the end of the 13th century by Tobias of Benesov, it was built at the beginning of the 14th century, following the model of french castles called "castels". The first touch to a medieval structure of the castle was made in the 15th century by Jiri (George) of Sternberk and was followed by Hodejovsky family in the 17th century, who converted the castle into a renaissance mansion. However, the most significant alteration took place in the 18th when members of the Vrtba family rebuilt the castle into a baroque residence. The utterly most important and famous owner of the Konopiste Castle was the archduke Fratisek (Franz) Ferdinand d'Este, a successor to the Austro-Hungarian throne whose assassination in Sarajevo in 1914 became a pretext of the the World War I. This man bought the Konopiste domain in 1887 from the Lobkowitzs family and converted it into a magnificent seat of a Heir. The Chambers were richly decorated with the collections inherited from the Modena's archdukes of d'Este and numerous hunting trophies hanging on the walls as silent witnesses of Franz Ferdinand´s hunting passion. After visiting the interiors of the castle, a close baroque Rose Garden with a Greenhouse provides visitors of a serene place to stroll and absorb the whole experience of their visit of the Konopiste Castle. The castle and chateau complex of Jindřichův Hradec, which has spread over the area of three and a half hectares in the course of the centuries, grew from an original Slavic fortified settlement from the 10th century on a rocky headland above the confluence of the Nežárka River and the Hamerský Brook. The shallow valley incision of the brook was used, in the oldest times, for an artificial water reservoir – the later pond Vajgar, serving for the defence of this important fortress.The construction of the mediaeval castle, called “Novum castrum“ (the New Castle) in the oldest preserved historical record from 1220, is connected with the name of Jindřich Vítkovec, the founder of the independent Vítek branch of the Lords of Hradec, which used the coat-of-arms with a golden rose in a blue field. At that time, the round Black Tower and the adjoining palace came into being. The castle, later enlarged into a magnificent chateau, served the Lords of Hradec as their main residence until the family died out in 1604. The members of the family essentially influenced all economic, political and cultural events in this region and representatives of each generation held important positions at the royal court. The importance of the Lords of Hradec was expressed in the gradual enlargement of the residence, from the solid Romanesque-Gothic castle into a majestic Gothic fortress with a complicated artistic solution and flawless fortification. In the latter half of the 16th century, under Adam II of Hradec, the castle underwent aAdam II of Hradec radical rebuilding to a representative chateau, after the example of the pretentious palaces of the Italian Renaissance. The castle fortress thus became a luxurious residence that satisfied the most demanding requirements of a Renaissance nobleman. Under the management of Balthasar Maggi and a number of other Italian builders, Adam’s building and the Spanish wing were built in the third courtyard, and both these buildings were linked by great arcades, and behind them, as the crown of the then building activity, a little music pavilion, the Roundel. This grand reconstruction practically completed the architectural development of the complex. Adaptations made by later owners were only of a partial character and almost did not affect the Renaissance shape of the chateau. Vilém Slavata of Chlum and at KošumberkThe last member of the family of the Lords of Hradec married Vilém Slavata of Chlum and at Košumberk in 1602, and after the death of her brother Jáchym Oldřich in 1604, he became the heir of the vast domain as well as the title “the ruler of the House of Hradec”. In Czech history he became known as the royal vice-regent, who was thrown out of the window of Prague Castle in the second defenestration in 1618. Over the ninety years of the rule of the Slavata family, the chateau did not undergo any essential construction adaptations. However, in the period of 1678 – 1696 the second arcade wing by the Roundel was built and in front of it the garden fountain was set. In 1693, Heřman Jakub Černín of Chudenice acquired the chateau byHeřman Jakub Černín of Chudenice marrying Marie Josefa of Slavata, who got Jindřichův Hradec as her share of the family heritage. The execution of important state functions and the relationship to the ruling House of Habsburg under the first Černíns brought to Jindřichův Hradec prominent visitors from among the members of the imperial court and other representatives of the European political scene. It was under the Černíns that the last major architectural remodelling of the chateau, which concerned the chapel, was carried out. In the years 1709 – 1735, the Gothic chapel of the castle was remodelled in the Baroque style after a design by F.M. Kaňka. In 1773, the chateau as well as the town were struck by a vast fire that destroyed a major part of the Renaissance interiors along with artistic collections. Temporarily roofed and abandoned by the lords, the chateau went on deteriorating. It was used as the economic centre of the domain, and the great arcades were turned into stables, the Roundel serving as a wood and game storage room and as stables. It was the wave of Romanticism that brought new interest in rescuing the chateau. In 1851, the family archives were brought from the Černín Palace into the remodelled premises of the chateau, which became the basis of the present State Regional Archives, still housed in the second chateau courtyard. In the early 20th century, the Viennese architect Humbert Walcher of Moltheim realised partial repairs and adaptations but some part of the chateau remained without repair. The Černíns owned the chateau until 1945, when it was confiscated, pursuant to Presidential Decree No.12/1945. The bad condition of the chateau complex kept on deteriorating and several buildings threatened to collapse. A general reconstruction was started in 1976 and lasted, with intervals, seventeen years. The chateau complex was rescued to the expense of 120 million crowns and reopened to the public in 1993. Zleby is a pretty village in the district of Kutna Hora in the Central Bohemian Region of the Czech Republic. It is called Zamek Žleby in Czech. 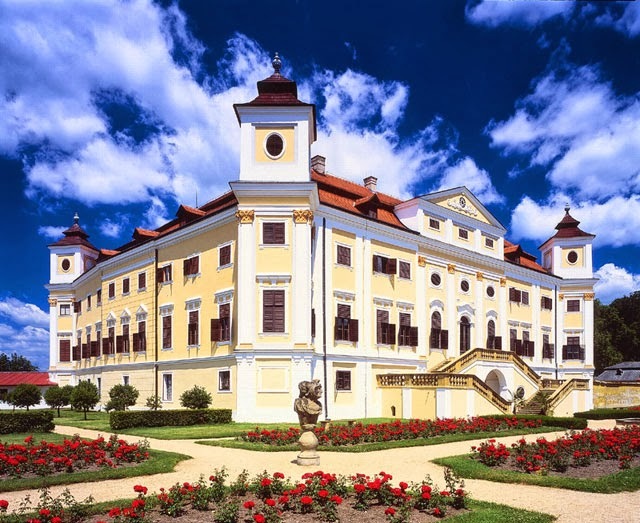 The most famous attraction of this place is the Zleby Castle which is a very romantic Baroque style castle which can guarantee to satisfy all your imaginations of how an old castle should be with its architecture and surroundings. The Zleby Castle was first recorded in the late 1200s and is believed to have been built by Henry of Lichtenburg. It is also thought that the castle was initially built on an old foundation that was laid in the 13th century. Another recognized owner of the castle was Zleb of Agnes from whom it was bought by Emperor Charles IV and thus it became a royal asset. Other well known owners of the castle are Markvart of Wartenberg, Stephen of Opocno, Jaroslav of Opocno, Henry Lacembok Chlum and many others. 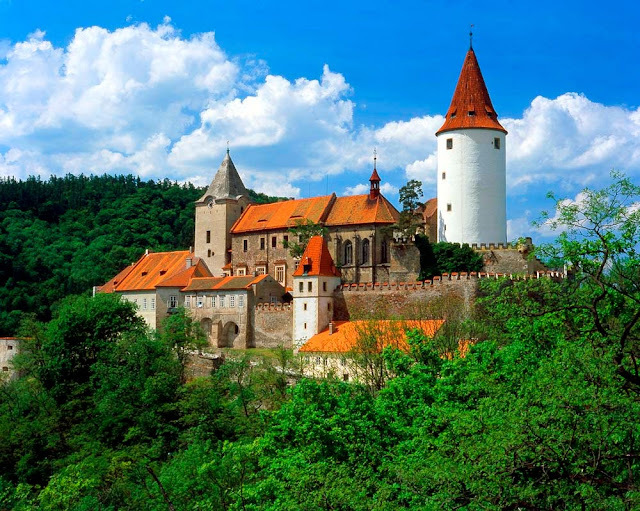 Bouzov Castle (Czech: Hrad Bouzov) is an early 14th-century fortress first mentioned in 1317. It was built on a hill between the village of Hvozdek and the town of Bouzov, 21 km west of Litovel and 28 km northwest of Olomouc, in Moravia, Czech Republic. The castle has been used in a number of film productions lately, including Arabela, Fantaghirò, and Before the Fall. Bouzov was established at the turn of the 14th century with the purpose to watch over the trade route from Olomouc to Loštice. 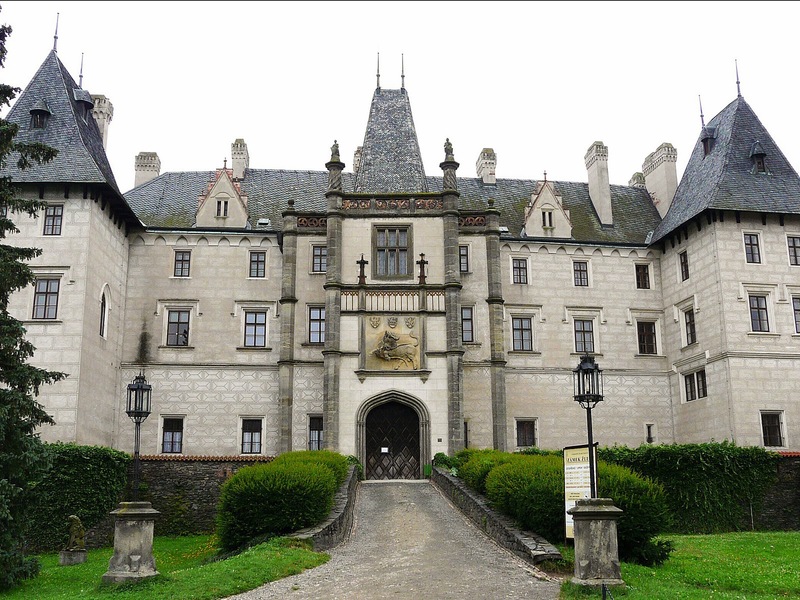 The minor aristocratic Bůz of Bludovec family were its first recorded owners from 1317-1339. The castle also takes its name from the family. Ownership of the castles was then changed, and the Lords of Kunštát were among the most important medieval owners. 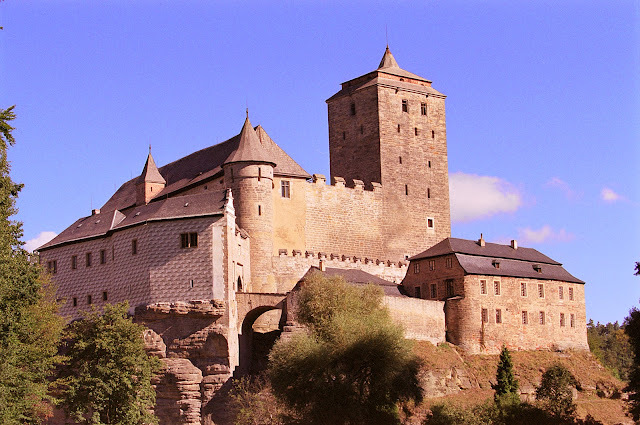 According to tradition, the Bouzov castle is often connected with name of the most famous member of this noble dynasty, Jiří z Poděbrady was born in Bouzov in 1420 and was crowned Czech King in 1458. His original title was Jiří of Kunštát and Bouzov. In 1558 the castle burned down, and lost much of its majestic quality. In the course of centuries there were several changes of proprietors; the castle was owned by the lords of Vildenberk, margrave Jošt, the Haugvic and the Pod Štatský families, and in 1696 the barony was bought by the grand master of the Teutonic Order, the Rhenish palsgrave Fanciscus Ludovicus. As various noble families changed possession of Bouzov, in a similar way also its appearance was changed from an early gothic castle to a Renaisssance style. In the time of the lords of Bouzov, the castle played mostly a defensive and guarding role. It probably consisted of a tower and rampart and wooden dwelling houses. The Vildenberks built a stony manor on the western side which was taller than the rampart. Already in the 14th century the castle was significantly widened - a settlement with outhouses was constructed with a ditch and circumvallation, rampart with a 200-foot-high (61 m tall) watchtower and a moat wall built around the castle. During the rule of the Kunštát family, the manor was fortified with a new connected rampart with two bastions, and the moat wall was rebuilt with five round bastions. Later a round gun-bastion was erected and the tallest watchtower was repaired. In 1408 the castle passed into the hands of Viktorin of Bouzov. In 1499 the Haugvics started the construction of a palace on the eastern side and connected the northern and southern dwelling building. In the first half of the 15th century t was converted into a Hussite stronghold, serving as a prison for captured Swedes during the Thirty Years war. In the second half of the 16th century the castle burned out and remained uninhabited. About a hundred years later, the reconstruction of the castle began again with the remodeling of the southern wing. At that time the castle had already lost its defensive function and became an utterly dwelling object. With the arrival of the Teutonic Order, during the 18th century the castle also lost this function. Only the building in the outer settlement remained inhabited, and by the end of the 19th century the ruin of the castle became a tourist goal. The castle gained today's appearance after massive Neo-gothic reconstruction between 1895 and 1910. The Grand Master of the Order of the Teutonic Knights from 1799 to 1939, archduke Eugen Habsburg, decided to rebuilt it in the Romantic, predoninantly Neo-Gothic style, according to the plans of the prominent architects of its time Georg von Hauberisser (1841–1922) of the Munich Polytechnic University; he was the author of Munich and Saarbrücken's town-halls, and also very influential as builder of churches like the St. Paul's church in Munich. The alterations were carried out with the intention of making part of the castle open to the public. Bouzov was fitted with modern furnishings and equipment, including running water and central heating. The order was abolished in 1939 and the castle was confiscated by the fascists, occupied and looted by the Nazis during the WW II. 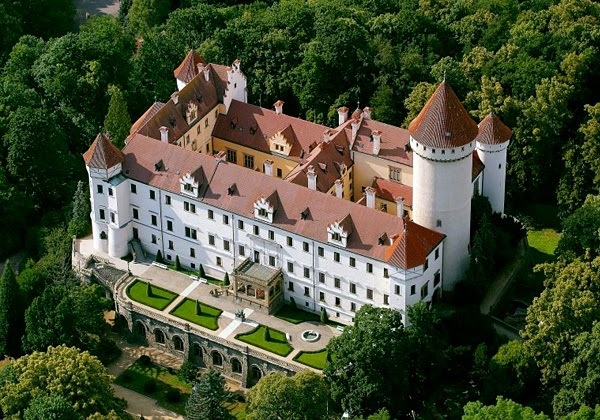 The castle was acquired by the Chief of the Gestapo R. Himmler, who forced the Strahov Monastery to sell it to him for one million crowns, as a present to A. Hitler. Hauberrisser's reconstruction of the Bouzov castle is unique in the was given tocontext of European romantic architecture. After 1989 the Order of Teutonic Knights expressed an interest in the castle, but their request to have it returned to them has so far been rejected. An eight-storey watchtower, 58 meters high, dominates the complex. The buildings are grouped around it in the form of a horseshoe, and the castle is enhanced by a number of towers, and among other things, bastions, battlements, oriel windows and loopholes. The two long bridges, ending with a short drawbridge, span the deep dry moat around the castle. The knights' hall, armoury, which is in one of the few original rooms with preserved Gothic vaulting, bedrooms of the knights and a neo-gothic chapel with its Gothic altar and tombs occupy the central part of the castle. The valuable furniture comes from the private collection of Eugen von Habsburg and the collection of the Order of the Teutonic Knights. Since 1999 the castle has been a national monument. The existence of an original fortress on the site of today's castle is assumed from sometime around the middle of the 14th century. The first written source is an entry into the land records from 1465, mentioning the division of the property of deceased Ctibor of Zásmuk, also of Vlčetín, between his two sons Petr and Václav. The fortress then might have been sold into the ownership of Diviš Boubínský of Újezd, who sometime around 1530 sold it to the knightly family of Káb of Rybňan. Of the Káb family, the most interesting character was undoubtedly the Knight Jan, a capable manager, active builder, and loyal Habsburg servant, who represented the prestigious office of tax collector in the Bechyňe region. His short life was tragically marked by the plague, which took five of his children in 1557. This might have been the reason that the simple castle chapel on the hill above the lake was built (today the chapel of the Holy Trinity). After Jan's death, Lhota was inherited by his three sons Bohuchval, Zikmund, and Jiří, who first had to compensate their older brother Jaroslav. Zikmund died four years later, and the families of the two remaining brothers Bohuchval and Jiří lived in Lhota at odds. The castle ceased to be their quiet home and became a theatre of squabbles, arguments, and personal assaults. It could be some of the stories captured in the memories of the occasional observers which gave life to the stories of the godless castle lady possessed by the devil, her tragic end marked by the bloody stain under the window on the then snow-white facade. This stain is said to have been the later reason to plaster the entire castle red. Such folklore later became the main motif of the enthralling prose of the Deštná priest Bedřich Kamarýt. In 1597 Bohuchval's son Jan bought his uncle Jiří's share of the castle, and instantly sold the reunited dominion to Vilém Rut of Dírná. The Rut family had owned Dírná since the 14th century, and had bought Deštná from the Rožmberks in 1595. Červená Lhota lay directly in the center and thereby joined the three dominions together. Lhota never was separated from Deštná again. The last of the Ruts, Bohuslav, had to leave the Bohemian lands as an Ultraquist after the Battle of White Mountain. In 1621 Červená Lhota was inhabited by Antonio Bruccio, a knightly commander of the Empirical army, an Italian noble who, in the service of the Slavats, oversaw the confiscation of Tábor and from 1621 served as commander of the municipal forces in Jindřichův Hradec. A fiery Catholic and great Marianic venerator, Bruccio proved to be a good diplomat and manager. He successfully protected the region from post-war pillaging, and strengthened the economic prosperity of Deštná by building a luxurious spa. The only remainder of the spa today is the chapel of St. John the Baptist, built directly above the source of the healing mineral waters. The dominion, evacuated by war, was shortly repopulated and Bruccio's own promise of loyalty to his Catholic subjects contributed to the settling of the area. In 1639 Bruccio died without an heir, leaving great contributions to the Deštná church of St. Otto and the Jindřichův Hradec church of St. John the Baptist, where he was buried. With his death, Lhota lost is function as a residence and served his successors simply as a simple occasional cotttage. After Bruccio's death, Červená Lhota passed into the management of the royal chamber, from which in 1641 the renowned aristocrat Vilém Slavat of Chlum and Košumberk bought it. His drive, diplomatic skill, education, and high intelligence led him to a high official career. From the position of royal marshall to Karlštejn burgrave to the president of the Bohemian chamber, he became the highest court-master of the Empirical court and soon afterwards the highest chancellor of the Bohemian kingdom, where he remained despite several resignations until his death. His marriage to Lucia Otýlia of Hradec meant the integration into one of the largest dominions in Bohemia at the time, that of Jindřichův Hradec. Červená Lhota then became a sort of summer residence, a place of parties, celebrations, and relaxation namely for the ladies of the Slavat family. Among Vilém's great-grandchildren there were no sons, so with the wedding of the second-born daughter Marie Markéta of Ferdinand Vilém, the oldest of Vilém's grandsons, the castle passed into the hands of the Windischgrätz family. Bedřich Arnošt Windischgrätz and his son Leopold dragged the dominion into great debts due to their out-dated style of economics, so the custodian of his under-aged successor Josef recommended the sale of the dominion. In 1755 the castle then was obtained by the free lords of Gudenus. Franz de Paul, free lord of Gudenus, shortly afterwards initiated several constructions. Not only was the spa chapel in Deštná repaired, but the church of St. Otto was decoratively furnished, most of which is still preserved today. Other building activities were brought to an abrupt halt in 1774 by a great fire, which destroyed essentially all agricultural buildings. In 1776 Červená Lhota welcomed a new owner, Baron Ignác Stillfried, a progressive aristocrat of Prussian Silesia, who immediately sold the Deštná spas into private hands. This definitively marked the end of Červená Lhota's aristocratic flavor. The Baron wrote his chapter of history into the castle mainly as a host and sponsor of the aging composer Karel Ditters of Dittersdorf, whose lifelong pilgrimage ended here at the castle after a four-year residency. In 1820 Ignác's son sold the dominion to Jakub Veith. If this enterprising industrialist and sponsor of Czech artists had any plans with Lhota, he evidently didn't manage to realize any of them. His daughter Terezie sold the castle again in 1835, this time into the princely hands of Heinrich Eduard Schönburg-Hartenstein. Heinrich Eduard Schönburg-Hartenstein, a major in the Austrian army, diplomat and chamberlain, settled in his newly-purchased dominion Černovice in 1823, and bought Červená Lhota in 1835. The center of his dominion, however, was Černovice, which became Heinrich's second home after Vienna. It is curious, then, that he sold Černovice in 1872 and the only item he left for his son Josef Alexandr of his South Bohemian property was Červená Lhota. Josef Alexandr Schönburg-Hartenstein, member of the Crown Council, was also active in diplomatic services. His youngest son and heir was Prince Johann, chamberlain, bearer of the Order of the Golden Fleece, Great Cross of the Order of Leopold, Order of the Iron Crown, Great Cross of the Maltese Order and Order of Christ. His greatest diplomatic accomplishment was fullfilled in his role as ambassador at the Pope's table in the Vatican. 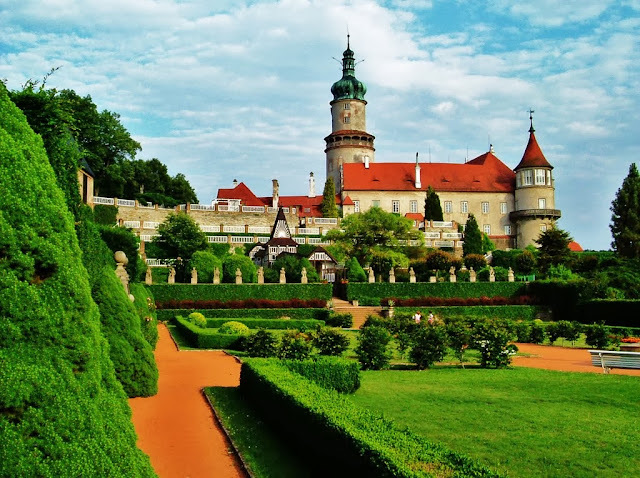 The First World War and consequent dissolution of the beloved monarchy caused Johann to withdraw into the solace of his dearest seat, Červená Lhota, where he evidently devoted himself to the reconstruction of the castle. In 1937 he was buried into the newly-built tomb, and thus was spared the destructive events of the new war, which drew the curtains closed for the entire aristocratic history of Červená Lhota castle. After the confiscation of the castle by the Czechoslovakian state in 1946 a children's clinic was established here, a year later it was assumed by the National Cultural Commission, and in 1949 it was opened to the public. 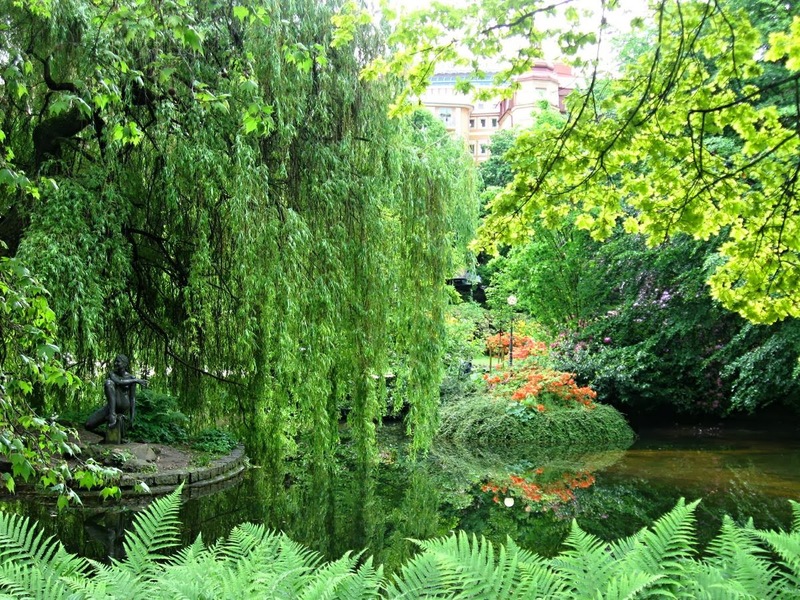 At the end of the 19th century, artistic gardener Jan Hahmann, who had been taking care of Skalník Park until then, finally brought into being his grandiose plan to create a new municipal park. Between 1877 and 1878, he initiated the planting of plane, oak, maple and elm trees behind the Army Spa Institution on the grounds of the former Winter's Garden. The park was complemented with sandy paths, pyramids of rose bushes, flower beds and a water recess with a fountain. Between 1880 and 1881, a cast-iron concert and restaurant hall known as the Blanenský Pavilion was built according to the design of Viennese architects Fellner and Helmer. In 1966, the restaurant was pulled down because of its poor technical condition, leaving only a part of the promenade, the present-day Park Colonnade. In 1974, the park on the edge of the spa zone between the Thermal Hotel and the Park Colonnade was redesigned by architect Adolf Peter and named Dvořákovy sady (Dvořák Park) in honour of the famous Czech composer . A monument dedicated to Antonín Dvořák by local sculptor Karel Kuneš was erected in the park. You may also admire two monument trees growing on the park grounds. The Park Plane Tree with 452 cm trunk circumference and height of about 23 metres has been growing here for almost 200 years and Dvořák's Plane Tree with 472 cm trunk circumference and height of about 22 metres has been growing here for more than 200 years.